Marilyn Dumont, celebrated Métis poet and author of A Really Good Brown Girl, which won the 1997 Gerald Lampert Memorial Award, returns to her roots with The Pemmican Eaters. Though other books have been written about the period of the Riel rebellions, Dumont brings a fresh perspective to the story. (The author is a distant relative of Gabriel Dumont, Riel’s general.) The collection blends personal stories with history uncovered through meticulous research. Though the Riel rebellions have mainly been viewed as a story of men, Dumont includes reference to the lives of Métis women, melding the personal and political to create a sense of intimacy. The result is a powerful collection that showcases Dumont’s mastery of language, narrative, and imagery. The plain language in The Pemmican Eaters is deceptive, as many of the poems are more complex than they appear and warrant more than one reading. Dumont’s work is visual and evocative, highlighting recurring symbols and images of a natural world that will be familiar to any dweller of the Prairies. Many of the poems show the strong influence of oral storytelling and cultural memory, as well as history and mythology. Dumont uses found poetry, prose poetry, stories, and quotes to fill out The Pemmican Eaters. (The title refers to the term John A. Macdonald employed to describe the Métis.) These elements recall the brightly coloured scarves worn by the Métis: poems are woven together to form a rich tapestry of emotions and images about the Riel rebellions in particular, and the lives of the Métis more generally. 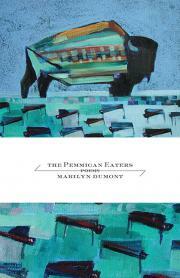 The Pemmican Eaters builds off the poet’s earlier work and highlights a writer who has mastered both craft and voice.